Headsets — like the Turtle Beach PX5 that Darrell reviewed recently — are great for listening to music on your own. But while you’re outdoors this summer, there are times when you may want to share your music with those around you. 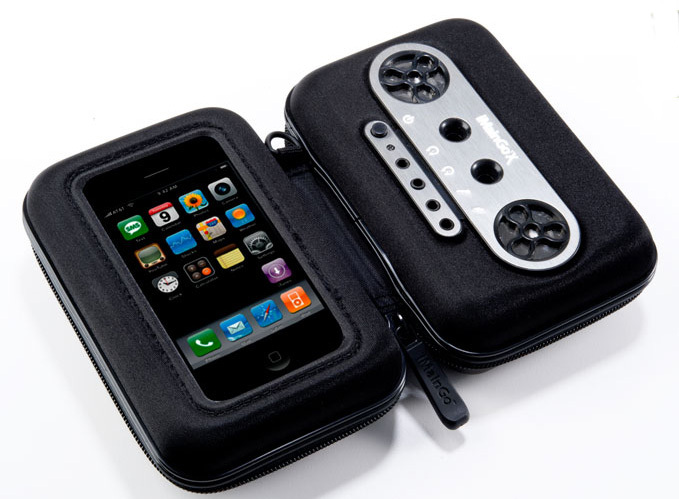 There are many portable boom boxes designed for iPods (s aapl) and iPod touches, but here are a few of the more unusual options. 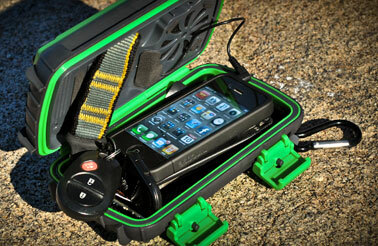 If you want something rugged for taking on a bike or to the beach, you might like the Eco Extreme. The manufacturer claims it is both waterproof and shock-resistant. It seems to seal pretty tightly, but I haven’t tested it in watery conditions yet. The Eco Extreme is designed to stand upright when desired, includes a carabiner for attaching to backpacks, and a pouch for storing cards and other small items in addition to your music player. It requires 3 AA batteries (not included), but the Eco Extreme will not charge your iDevice, since it uses the headphone jack to connect. This is a bonus if you ever want to use the Eco Extreme with something other than an Apple product. The 3-inch speaker is pretty small, and is rated at 3 watts and a frequency range of 200Hz – 10KHz. It puts out decent sound for its size, but don’t expect high fidelity. However, the Eco Extreme might be a good way for the kids to listen to music while at the pool or the beach. 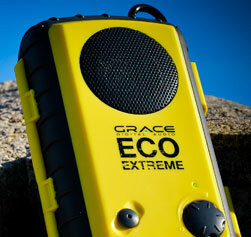 The Eco Extreme comes in several colors, retails for $49.99, and is available from the Grace Audio website. If you want better sound quality, and don’t mind doing without the shock- and water-resistance of the Eco Extreme,the iMainGo X, which also has a number of additional features. It connects to your music player using a standard headphone jack, and it has a flexible, clear plastic cover on one side so that you can access your player’s controls without taking it out of the case. 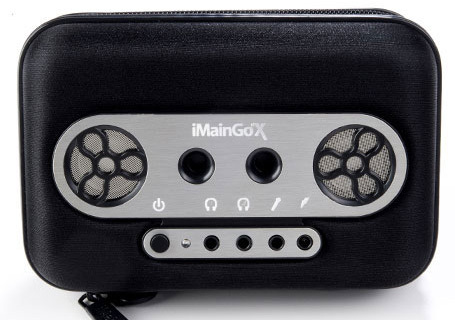 You can use the iMainGo X with iPhones as well as iPods and iPod touches, and with other MP3 players. Since it has both an aux and mic in jacks, it can even be used with iPads, Kindles (s amzn), tablets, and laptops — even gaming consoles and guitars! Unlike the Eco Extreme, the iMainGo X has an external headphone jack if you want to keep your music to yourself — in fact, it has two, so your kids can share in the backseat without disrupting your peace and quiet. The design is kind of cute — it looks a bit like an old-style cassette Walkman (s sne). The holes where the reels would be are actually the speakers, and their fidelity is much better than the Eco Extreme. I was quite impressed with the quality, frequency range, and volume that can be produced by the two 37mm (about 1-1/2″) speakers. You can even daisy-chain more than one iMainGo X if you want more sound. The iMainGo X uses a rechargeable lithium-ion battery rated for 12 hours of playback time, and it comes with an AC adapter, a travel bag, and a carrying strap. It retails for $69.95, and is available through the iMainGo website and other online retailers. The SuperTooth Disco is the 800-pound gorilla of portable sound. With a rating of 28 watts, this speaker can put out an amazing amount of high-fidelity sound, with excellent frequency response. In fact, I’ve found that it’s a bit difficult to set the levels low enough to not blast out the neighbors, which is hardly surprising since the SuperTooth Disco has specs that include two standard speakers rated at 8 watts each, plus a 12-watt subwoofer. As you might guess from the name, ths SuperTooth Disco connects to your player using Bluetooth A2DP, so it can be used with Macs, iPods, iPhones, iPads, and many other devices. It also has a standard audio line-in jack, so you can use a cable if you wish. I’ve been using Bluetooth, and playing music from my MacBook Pro has never sounded so good. I’ve heard interference on rare occasions, but never often enough to be a problem. The Disco includes a NiMH battery pack rated at 10 hours of playback time, and an AC adapter. At 89 x 315 x 70mm (3.5 x 12.5 x 2.75 inches) and weighing 1140 grams (2.5 pounds), this is definitely a speaker that you won’t want to put in a backpack or on a bike, although it does come with a carrying case. But if you really want to share your music with a crowd at your next summer party, the SuperTooth Disco can handle it. The Disco retails for $149.00 and is available in the U.S. at department, specialty and mobile phone stores; the manufacturer’s online shop seems to be only for European orders. This one’s a bit ridiculous, and could be a relative of the Swoop, but I have three friends with kids who said they want one after taking one look at it. 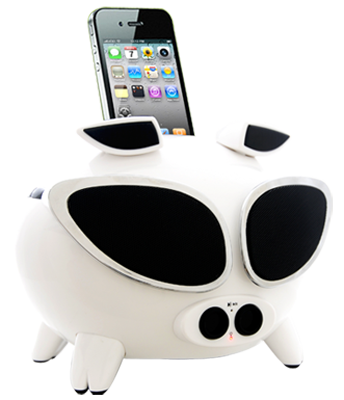 The iPig actually has very good sound. It comes with five speakers, including a 15 watt subwoofer. The iPig puts out 25 watts, and it has adjustable bass and treble, so it’s not far behind the SuperTooth Disco in sound capabilities. You can control the volume by touching the pig’s ears, which is a nice touch. To make other changes, you’ll need the included remote, which works fine, but is tiny and will probably get lost quickly. The iPig can be operated with an included rechargeable lithium-ion battery rated at 6 hours of operation, or using the included AC adapter. It will even recharge your iDevice through the dock connector in the pig’s head. It’s portable, but its shape isn’t conducive to carrying, and it’s surprisingly heavy, so I’m not sure kids are going to want to lug it around. The iPig comes in regular and “cool” versions; the regular version has round eyes, and the cool version looks like it’s wearing shades. Oh, and if you don’t like white, it comes in yellow, pink and black, and the same manufacturer makes the iPanda, the vaguely apple-shaped iPom, the miSoccer soccer ball, and the ghostly iBoo. The iPig retails for $139.99 and is available from the Speakal website. 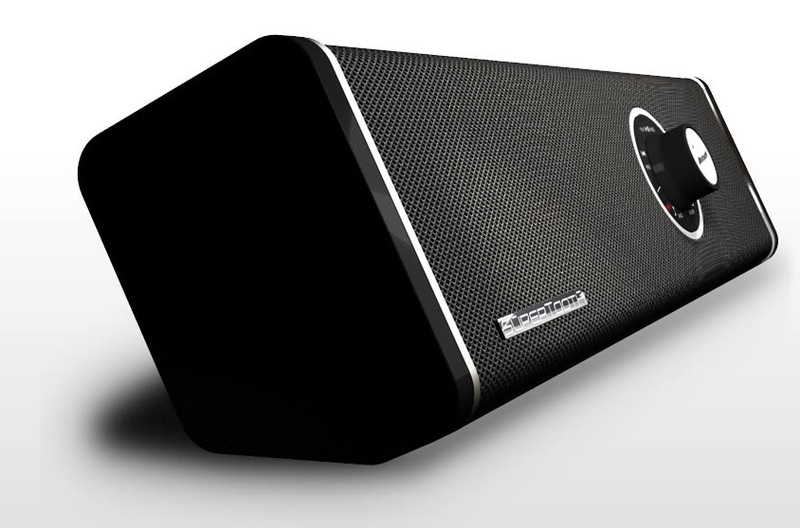 Disclaimer: All speaker systems tested for this review were provided by the manufacturers. Don’t forget the Jawbone Jambox … for such a small and portable package, it packs a wallop and fully bluetooth. You also get the added bonus of a speaker phone along with it.